Savory Butternut Squash Soup, Thyme for Cooking gourmet soup. Butternut squash makes a lovely, creamy soup with no cream and very little fat. I added a bit of tomato paste to this which added another layer of flavor; a bit of tart to the squash's sweet. A bit of Sherry, and a dollop of crème fraiche or sour cream to finish and you have the perfect autumn soup. Peel butternut squash using potato/vegetable peeler. Cut it in half the long way (blossom to stem) and remove seeds. Cut the squash into small cubes, roughly 3 cups. Purée soup using blender, doing mainly the solids first, adding broth as needed. So you can control the liquid - the liquid content of the squash can vary. When all the solids have been puréed you can add more broth as desired. Return the soup to heat, stir in the herbs, tomato paste and sherry. Gently reheat. 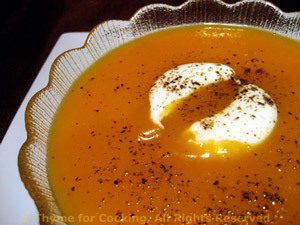 To serve, ladle into soup plates or bowls, put dollop of yogurt in the center and serve.